The TED conference has given me a huge responsibility. They’ve handed me one of a small handful of press badges (as I understand it fewer than 10 are handed out every year). Regular tickets are $6,000 each and the conference was sold out more than a year ago (next year’s TED is already sold out). They do put a major restraint on the press covering the event: no filming, or recording of sessions. Another restraint? No computers in the main session unless you want to sit in the back row. OK, I can live with that. 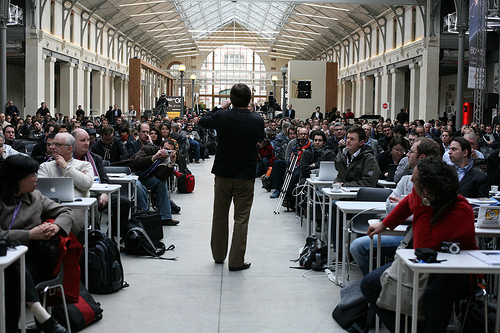 So I doubt you’ll see a view of TED like I got of Chris Anderson, TED’s curator, in photo above, while he spoke at LeWeb. But, really, this isn’t an event that generates news (except when last year Bill Gates released a bunch of mosquitos). If you’ve ever watched a TED Talk you’ll know that this isn’t about news, but is about expanding your mind. Coming up with new ideas. Hearing from people who are changing the world and being challenged to do the same with your own life. In fact, they’ve asked me to not bring my computer or phones to the main sessions and just absorb the TED experience (Chris Anderson, the guy who runs TED, spoke at LeWeb a year ago and walked into the audience and told them all to close their laptops and listen, he really believes that we can’t learn if we’re multi-tasking and paying attention to email). As you might expect I’m thrilled at being asked to do this and I’m even going to report my time at the conference as vacation so that I won’t feel pressured to take care of Rackspace business while I’m there). But when people invite you to a conference that costs everyone else $6,000 they are laying a huge responsibility to that person. The question is, what’s the responsibility? For me, I’m going to try to get as many interviews as I can outside of the main room. That’s one way of delivering value to you. But that’s just the baseline of the kind of responsibility that I’m feeling going into this. Can I step up my game this year? Can I improve the world my children are growing up in? That’s a little closer to the weight I feel through this gift. Why is this such a big deal? Well, when I was first on musician Peter Himmelman’s show a couple of years ago I told him I try to live every day like a TED conference or a FOO Camp (O’Reilly’s famous conference where they invite a bunch of geeks to camp out over a weekend). I’ve been very fortunate to have had tons of great people in front of my camera lens (my off-the-cuff work is on YouTube, my pro work with Rocky Barbanica as cameraguy and producer is on building43). That’s why I’m so excited and why I feel a ton of responsibility going into this event and I’ll try to bring you into the event as much as possible. One thing, watch Chris Anderson’s Twitter account. He runs TED and is an inspiring figure in my life. He and his team has laid a heavy responsibility in front of me. How should I handle it? Here’s the schedule, who would you like me most to interview? I’m giving away my Kindle. Why? 1. I have the Kindle app on my iPhone and I use that to read books a lot more than I use my Kindle. 2. I will get Apple’s iPad in two months and while that’s a shiny new object I’m sure I’ll use that a lot more to read books than the Kindle, at least until my eyes get strained as some of my commenters were promising would happen. 3. I have a stack of paper books that PR folks have sent me, so for the next two months I am going to try to catch up on those. 4. Even if I find after all of this that I like the Kindle better, I want the larger screen version of the Kindle, so this would let me get that. So, how am I going to give it away? Leave a comment here about what you’d do with yours by the end of the day Tuesday (Pacific Time). Most creative answer gets the Kindle. It’s in new condition. I will bias towards those who will use it to help the world, or who can’t afford to keep up on the latest gadget train. Sorry, it won’t come with an Amazon account so you’ll need to buy your own books. I just recorded a 45 minute conversation on my iPhone while we sat on the deck at the Half Moon Bay Ritz with Luke Kilpatrick about Flash, Silverlight, Palm Pre, and a few other topics, but mostly focusing on what will happen to Flash. Luke is a developer who uses Flash in his work for Altus Corporation and he also runs a variety of user groups in San Francisco. He’s one of the few people I know who loves his Palm Pre and he is a Flash believer so I thought it would be good to get a counterpoint to my post earlier. At one point we talk about Adobe’s Openscreen Project where Google’s CEO, Eric Schmidt, pledges support for Flash and the Openscreen Project. If you crunch the 45-minutes down it comes down to Google +will+ save Flash because Adobe’s 10.1 is finally ready for mobile phones. Adobe is, next month, going to show off its new mobile strategy, at the Mobile World Congress, he told me. Anyway, want a good counterpoint to my “Can Flash be saved?” post? Here it is. 1. We haven’t seen the new Flash implementation for mobile phones. 2. We don’t know how well Google will do in its fight for mindshare against Apple (and, so far, Google has been coming in #2). 3. Even if the implementation is freaking awesome and Google makes headway with it Apple will still have close to 100 million devices that won’t have Flash on them by the end of the year. 4. Developers care about getting paid and so far Apple’s platform is better at getting them paid than other platforms. Will this change this year? Unknown. 5. Even if Adobe does everything perfectly and so does Google, Flash still has a major black eye amongst many developers. Can Adobe talk developers into supporting Flash with all of the angst I’m seeing about it? Luke says yes, but I’m still not sure. Another point of view worth reading is John Gruber’s Daring Fireball post about Flash. “Developers go where the users are,” he says. I’d add developers also go where there’s a fun platform to develop for and my other developer friends are slobbering over themselves to develop for the iPad. Yesterday I talked with Rackspace’s mobile developer, Mike Mayo, who developed our iPhone app for Rackspace Cloud. You should hear what he says about the iPad (a longer video with him will be up on building43 next week). I recorded a short audio conversation with him too, which I’m embedding here. What do you think, has your view of Flash’ future changed this past week? Why or why not? Robert Scoble is an employee of Rackspace, which can help you with all your hosting needs. He is chief troublemaker in the building43 community of Internet fanatics. You can reach Robert via his cell phone at +1-425-205-1921 or email at scobleizer@gmail.com. Visit Robert's Google Profile to see his Calendar, etc. All opinions you read here are Scoble's own and are not necessarily those of Rackspace.